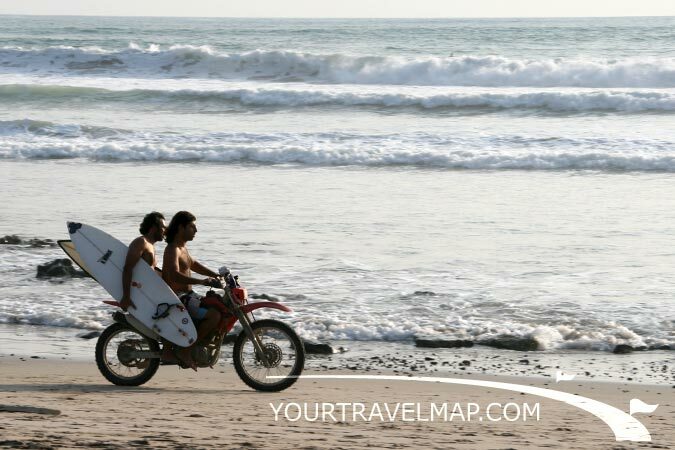 Two surfers use a motorcycle to get to their next surf session In Santa Teresa Beach. Santa Teresa Beach used to be an insider tip, but now it is an inherent part of many itineraries. 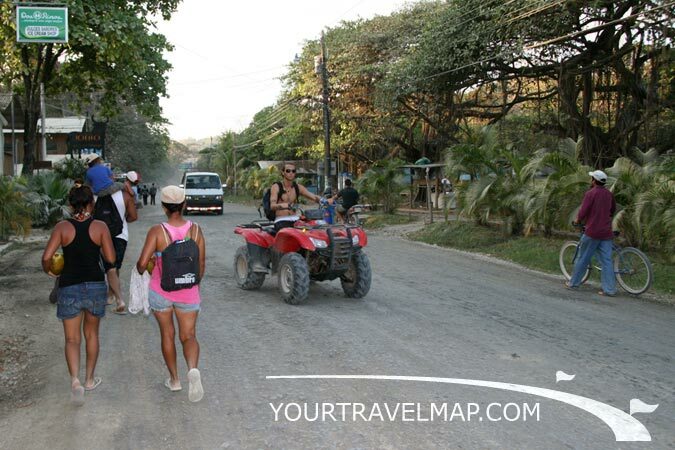 To reach Santa Teresa Beach one still has to drive a part of the route on unpaved roads. A four by four is necessary for these roads, especially in the rainy season. The nearest small airstrip is located in Tambor Beach. A large number of the tourists in Santa Teresa Beach come for surfing. The waves break over a sandy bottom and are suited for surfers of all levels. 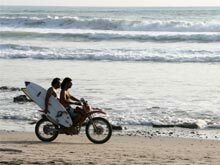 In the village and in neighboring Malpais Beach are several surf camps and surf schools for those that want to learn the sport with a professional instructor. Scooters and quads are a popular form of transportation in this surfing town. The 1250 hectare Nature Reserve Cabo Blanco is located north of Santa Teresa Beach. Originally access was not allowed to the nature reserve, but since 1985 it is open to the public. Birds and butterflies are the fauna that are the easiest to spot. With a bit of luck one will discover Coatis, Monkeys and Raccoons. 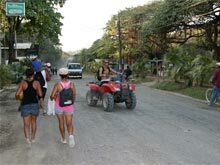 Many adventurous tourists start their journey, to the north, along the coast of the Nicoya Peninsula in Santa Teresa Beach. Most of this route is unpaved and without a four by four there is no getting through. The rivers Rio Bongo and Rio Ario have to be crossed and at times in the rainy season they have to be circumvented. Santa Teresa Beach is locate in the province of Puntarenas. Distance from San Jose to Santa Teresa Beach: 134.9 kilometers respectively 83.7 miles. Travel time from San Jose to Santa Teresa Beach: 4.56 hours. Distance from Liberia to Santa Teresa Beach: 209.8 kilometers respectively 130.4 miles. Travel time from Liberia to Santa Teresa Beach: 5.03 hours. The four by four is essential because of the higher clearance when crossing the rivers. The route passes through many small beach villages and in most of them one can find an accommodation.